Never Enough Nails: Lynnderella Friday, Vol. 34! Well it's officially March, crazy time for me! We already have a bunch of shows today and both days this weekend, so we're kicking off St. Patrick's Day month pretty well, haha! I am already sporting green nails too, so I'm well prepared. 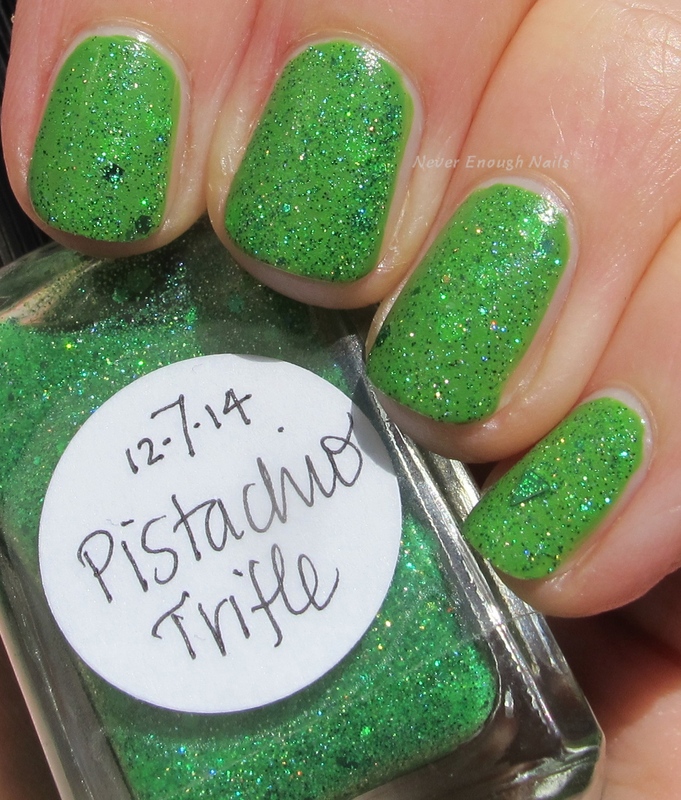 Speaking of green nails, Lynnderella Windfall is a shimmering forest green with holo microglitter. Lynnderella describes this as a "multishimmered dark green with subtle gold holographic microglitter". It's very complex looking and the holo comes through nicely. 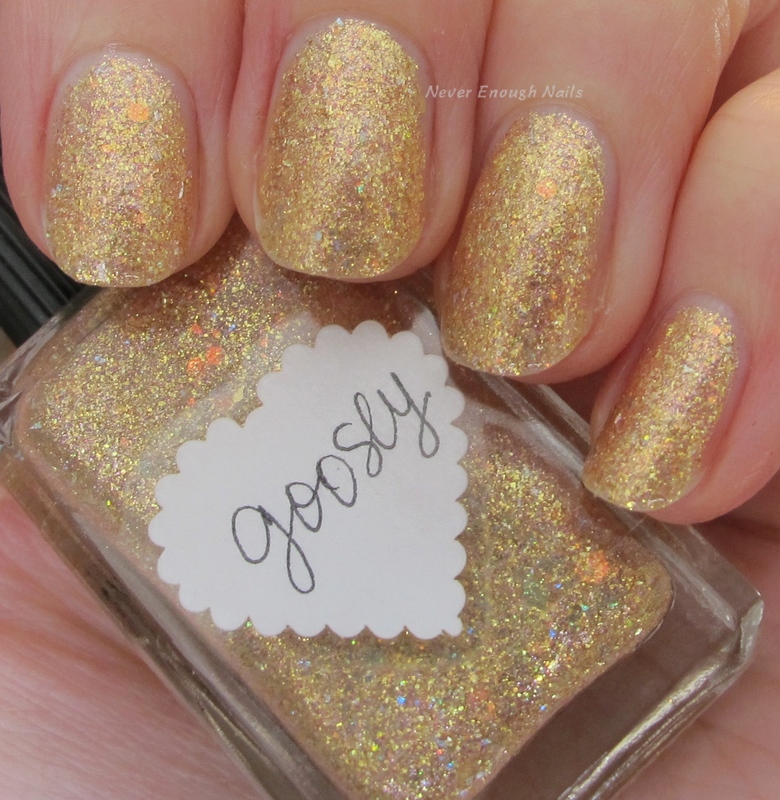 I don't see the gold microglitter, but it does lend a nice warmer sheen to the polish. This is two SUPER easy coats of Windfall. You probably could do one coat depending on your application. This was also really smooth without top coat, although I did use one layer to bring out the shimmer. I will definitely sport this one during March!! Lynnderella Goosey is a glowing golden treasure of a polish. 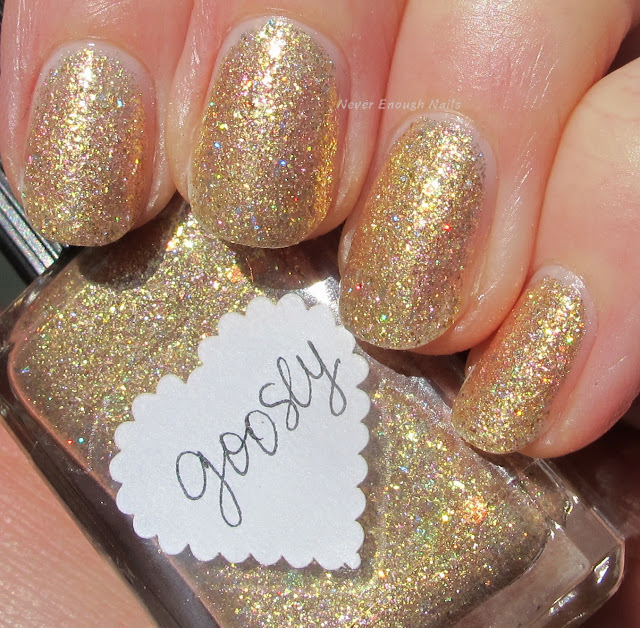 It is a combo of golden shimmer and gold holo microglitter with lots of pink shimmer. It also has these awesome iridescent fire opal glitters that might be a new favorite of mine. I think you can see those best in my indoor picture (a few pics down). 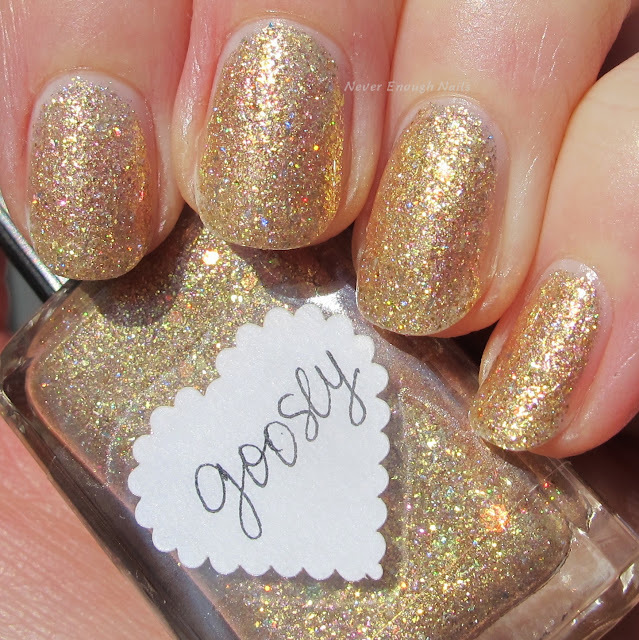 I think the pink shimmer in this will make it wearable for people who think they can't wear gold polish. This is two coats of Goosey. It applied very nicely, I didn't have to do any clean up. Like Windfall, it was pretty smooth without top coat, but these swatches have one layer to accentuate shine. Below is the indoor picture. The fire opal glitters are so cool! They just glow! 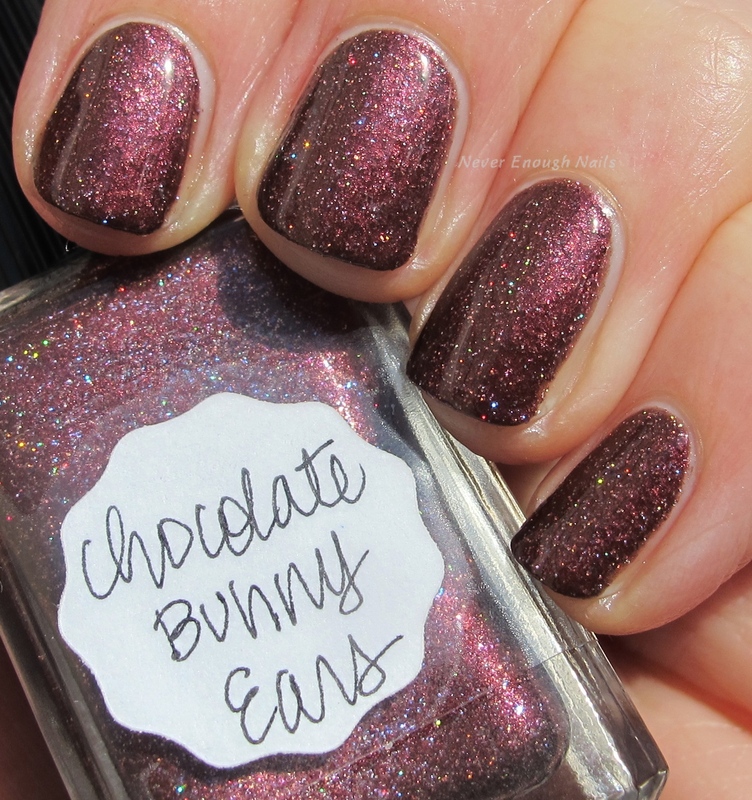 OMG Lynnderella Chocolate Bunny Ears makes me want chocolate SO BADLY!!! But I gave up chocolate for Lent! I also gave up complaining, so I can't even complain about not eating chocolate! 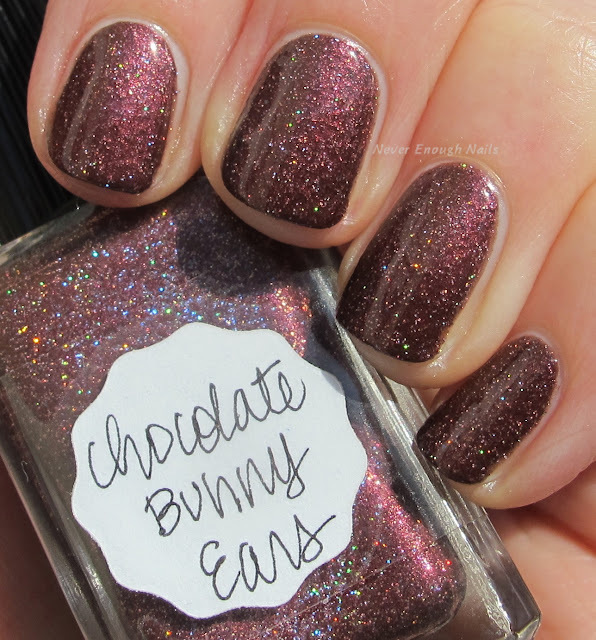 Chocolate Bunny Ears is a delicious rich reddish chocolate with lots of holo glitter. 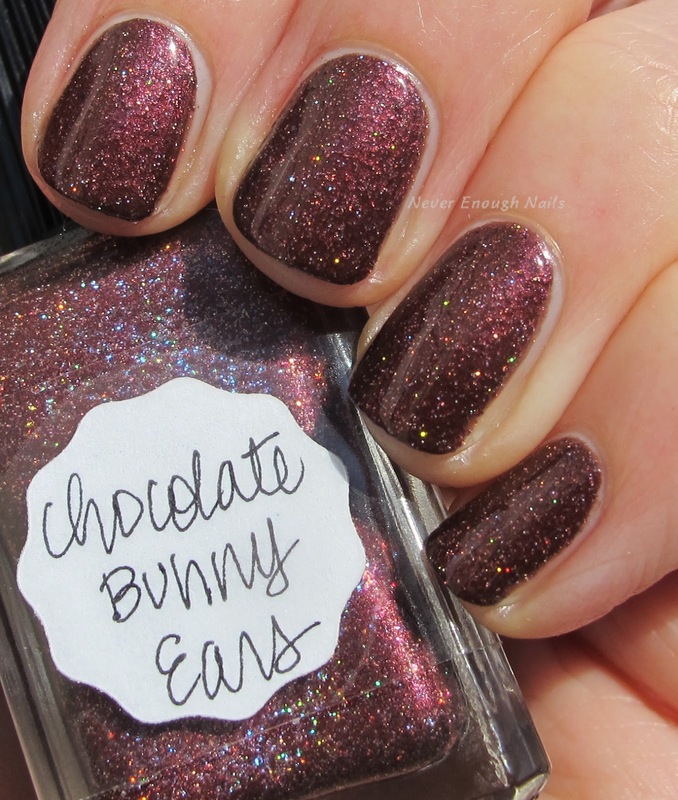 Lynnderella describes it as "chocolate creme shimmer, pink holographic microglitter and pink shimmer". I like to describe it as "YUMMY!". This is two coats. Great formula, nice and smooth application. And now for my current NOTD- Lynnderella 12-7-14 Pistachio Trifle over OPI I'm Sooo Swamped! 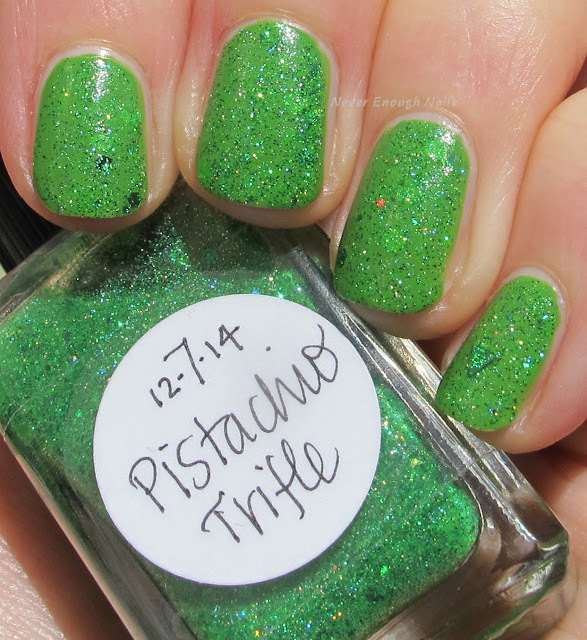 Pistachio Trifle is an Advent polish that I purchased back in 2014 when it came out, but I thought it would be a great topper for I'm Sooo Swamped! Turns out I was right, these two are a perfect pair! With the exception of Pistachio Trifle, these are all available now on lynnderella.com. I don't know if Pistachio Trifle is sold out or if it might pop up someday, but you can always email Paul (lynnderellalacquer@gmail.com) if you are looking for a polish. A Spring-y Lynnderella Friday, Vol. 36!